Specialty: Collecting dollar bills on the ceiling! This review is not so much about the food as it is about the history. 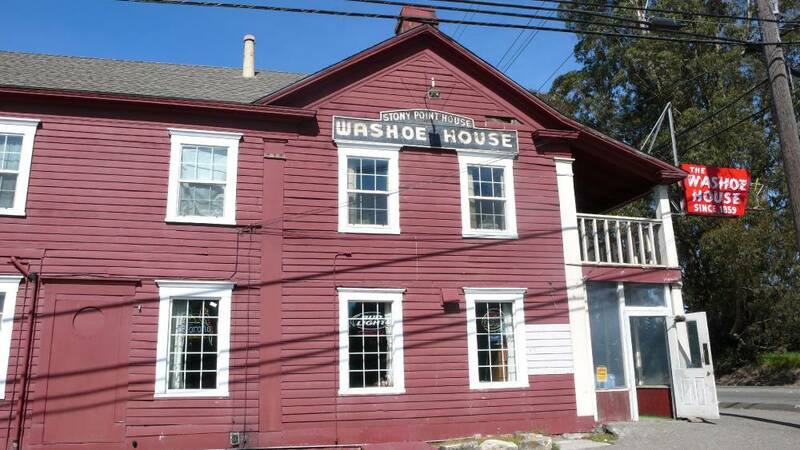 Since 1859 this one-time hotel and stagecoach stop between Santa Rosa to the North and Petaluma to the South has been serving both Confederates and Yankees alike before and after the Civil War. However, apparently a few days after the actual war ended, in early April, 1865 and a day before President Lincoln was assassinated, Petaluma planned an attack on Santa Rosa on April 14, 1865. Petaluma was a Northern sympathizer, while Santa Rosa held primarily Southern attitudes. At the time, there were two newspapers, the Argus in Petaluma and the Democrat in Santa Rosa, and they had been sniping at each other throughout the war. Finally, the Petaluma Volunteer Firemen’s Brigade had enough and got on their horses and started riding toward Santa Rosa, intent on settling up with those boys. En route they stopped for liquid fortification at The Washoe House. After several rounds, then several more, they ended up never leaving and at sunrise the next day, their wives came to collect them. That was the end of the Battle of Petaluma and Santa Rosa. But you needn’t worry about choosing sides. 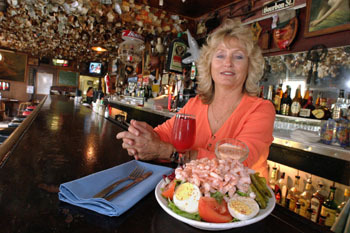 Cheryl Jensen, the current co-owner/manager of Washoe House is the daughter of Edith and the late Bill Drew, who revived a “dead-as-a-doornail” business when they purchased The Washoe House in 1974 with two other partners and turned it into a popular hangout for locals and tourists. Today, Cheryl is just happy you stopped by for a drink, maybe some food, and a chance to soak up some local history. By the way, leaving a dollar bill on the ceiling is encouraged! 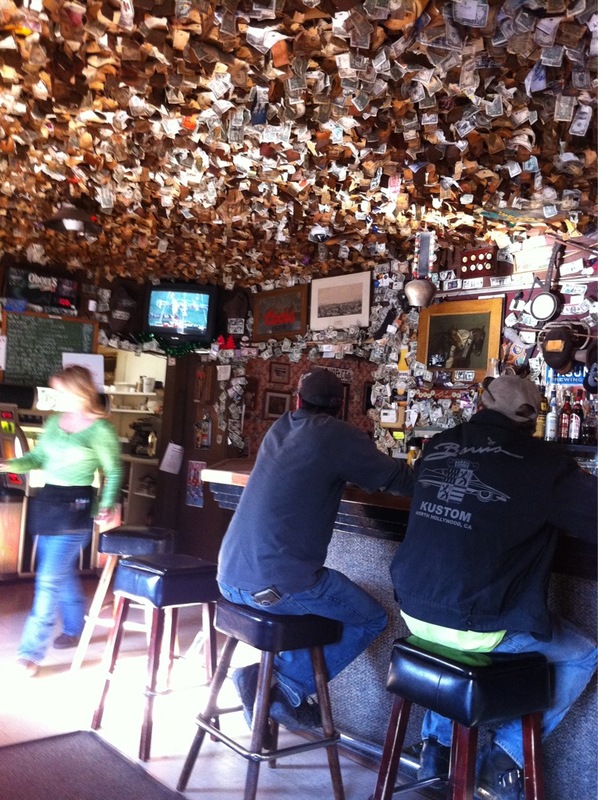 It started when the miners and ranchers came in and they would pin a dollar bill to the ceiling. If they were broke the next time they came back, they could always pay for their drinks by finding their bill on the ceiling! Makes sense. Today, folks just do it for fun. According to “experts”, there is more than $10,000 in dollar bills pinned to the ceiling and creeping down the walls. On to the bar food. Decent Burgers, French Fries, Steak Sandos and Fried Chicken. Best bargain: Shrimp Louie. At $10.50 for a small, it’s loaded with fresh shrimp meat. And for dinner, fresh Halibut, Steaks and Prime Rib. It’s a great watering hole, for sure.